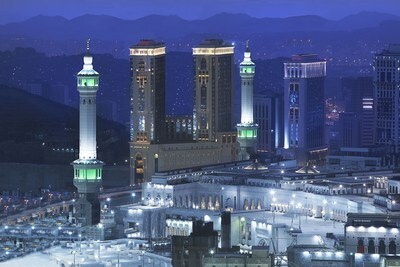 MAKKAH, Saudi Arabia: PRNewswire: Makkah’s first ever hotel to combine both guest and business facilities, Hilton Makkah Convention Hotel, has hosted a highly successful first Ramadan following its launch in the Holy City in April 2017, with more than two million pilgrims from across the globe expected to have visited the Grand Mosque this year, with Indonesians, Pakistanis and Indians the largest international travellers. GM of the five-star Hilton property, Mark Allaf, spoke about the challenges of operating such a unique facility in The Holy City, noting, “This was a truly ground-breaking opening for Saudi Arabia and for the Middle East in general. “Ramadan and Hajj has, this year, been key for us, and a challenge we very much looked forward to leading up to the Holy Month. Following our opening in April, Ramadan has provided an important opportunity to combine religious trips with business. By 2025, more than 30 million pilgrims internationally are expected to visit Makkah during the Holy Month, increasing the demand for the services of hospitality outlets such as Hilton Makkah Convention Centre. Boasting 764 rooms and suites, the hotel also provides a diverse portfolio of F&B outlets to cater for the demand from guests and other Makkah visitors, whilst maintaining first-class standards. In addition, the recruitment process has been intensive in recent month, with the goal of employing a minimum of 40% Saudi Arabian national staff members. Mr Allaf also revealed that around 25% of the workforce on site are female. He added, “The positive opportunities for talented young females in Saudi Arabia is changing quickly and we are part of that.